The recent release of the all singing and dancing, gorgeous-looking, plot heavy, monolithic open world RPG known as the The Witcher III makes Geralt’s original foray in the series look positively retro. That’s what Shane has indicated anyway. For whilst he has spread much love with his Xbox reviews of the sequels, he has also systematically failed to get his AMD-ZX81 to successfully boot up 2007’s adventures of everyone’s favourite infertile, lady-loving and hard-as-nails mutant silver fox. Lucky me: as The Pixel Empire’s resident PC overlord, I got to play it instead. 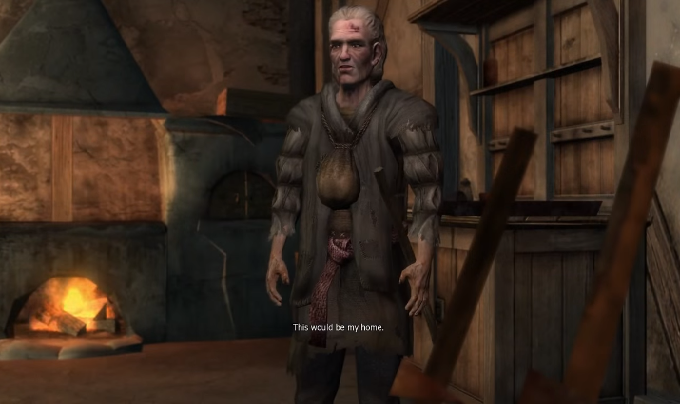 The Witcher is quite different. Not in the thematic sense of course. The wily-haggard hero looking to stick a razor-sharp shaft up the Khyber of evil deviants is all present and correct. But it was largely untypical of the standard RPG template at the time. Character creation was out the window. Want to be a mage? Tough, you cannot. Want to be a massive loser as a goody two-shoes paladin? No chance. 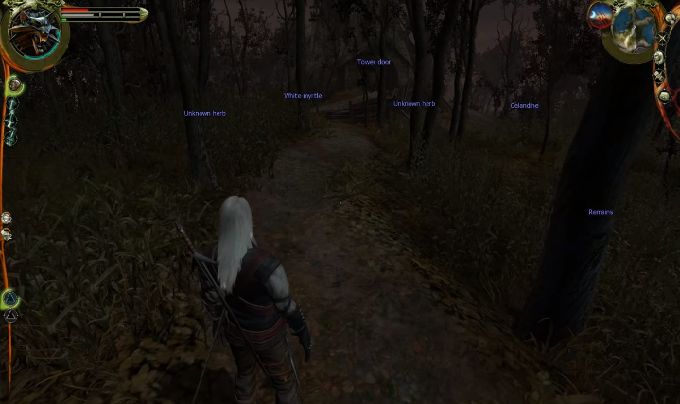 Here you can be Geralt and Geralt only. This works remarkably well though. The elaborate (and rather gorgeous looking) introduction provides a grounded back-story of the Witcher that your transition into becoming him is entirely natural. The amnesia Geralt suffers at the on-set is also an incredibly smart plot-device. 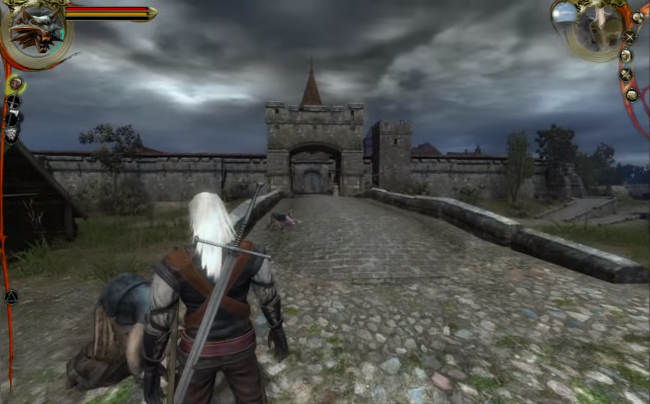 He doesn’t remember who he is or what he has done beforehand, granting the player a degree of independence in how they approach the task of a Witcher. An effusive, bad-assed monster hunter or a tender, caring lover – the choice is yours. Secondly, The Witcher is very much on a different scale to Geralt’s latest incarnation. Back in the day the big G was much more about girth than length, so much so that the lack of a sandbox environment is actually a pleasant surprise. The scaled down areas of each chapter, conforming to a more linear form of gameplay, ensures unnecessary plodding around (the evil of some modern RPGs) is non-existent. The self-contained city of Vizima and its surrounding outskirts and swamplands are more than sufficient to hold ones attention. Sure, side-quests do exist, but none of these feel particularly extraneous to the main story and more often than not are linked seamlessly to the plot. 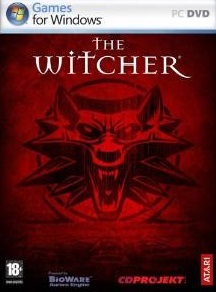 As such the world of The Witcher never gets too big for its boots. Neither does it bore the player into endless tasks without resolution. Matching this smart design are some novel game mechanics. The off-the-shoulder 3D perspective may be all the rage now (Dead Space, Uncharted, Dead Souls, etc.) but in 2007 it was still a fairly novel approach. It certainly allowed for a more heightened combat experience away from the typical THACO calculations or Oblivion’s bashing the mouse button approach. 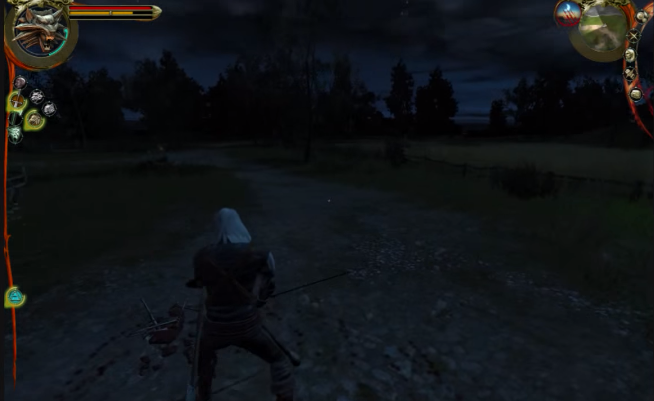 The Witcher is, instead, all about timing your blows and building a string of combinations together for maximum penetration. Applying different stances dependent on the enemy faced or when to use your heralded silver sword also makes combat a more tactical affair than a straightforward button-mash. The additional fusion of drinking infamous Witcher potions for heightened abilities combined with the availability of a few magical powers ensure the combat system requires some skill to fully master and appreciate. There is a meaty challenge here in the place of a simple hack and slash to match the insightfulness of the role-play. Indeed, the choices one can make throughout the game is very much welcome. Be it character progress through the wide-ranging abilities on offer as Geralt becomes more experienced to the specific tailored decisions one has to make in supporting or annihilating a fringe group looking to plunge Vizima into civil war, both benefit the investment in character and plot. Sure, the latter does suffer from the perception that choices made have real world gameplay consequences (they do not), but the subtle changes which do occur are smart enough to add value to the story-telling. For instance, save a witch early in the game and at a certain point she will reappear and thank you for the deed. If instead you decide to throw her to the wolves in the early encounter then a randomly generated character will be populated to take her place at the later juncture. The sense of in-game continuity is a neat, thoughtful touch; it certainly makes Geralt’s story arc all the more compelling and rewarding. ​There is the occasional niggle, but these are relatively slight in nature. The lovingly crafted introduction is overly long-winded when you just want to get stuck into kicking arse. The voice acting is also occasionally on the pants side. Not Alien Breed: Tower Assault’s unintentionally hilarious Yorkshiremen in space bad, but enough to distract from the otherwise convincing world that has been developed. More importantly, act IV appears a bit of a misstep in pace. Just when the game appears to be approaching climax our hero is whisked out of Vizima for some rest and relaxation. Whilst this does add to the subtlety of the rather under-stated Keyser Soze ending (which is quite marvellous) it is also the one point where the plot becomes a little more plodding and derivative than previously. Finally, some have previously stated the fighting mechanics are poorly implemented; however, this is pure nonsense made of pish. Just because it is different to the norm does not make it bobbins! Given time, combat becomes a fairly intuitive and marvellous beast. Besides the tutorial aspect of the prologue section is competent enough to ensure even the most dunder of dunderheads can implement the combat mechanics without massive amounts of difficulty.